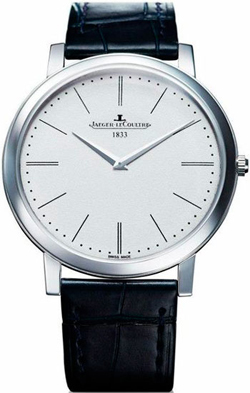 Jaeger-LeCoultre Master Ultra Thin Jubilee – a Modern Interpretation of the actual Classics Round Polished Case, concisely designed dial on which time Round and Round rushes into Eternity. For ITS central display Used Arrows Showing the hours and minutes. Oblong hour Markers, interspersed with Minute scale, form a Visually Harmonious, Repeating Pattern. Minimalist the design of the watch is a true Striking Proof That Beauty does not need too much pretentiousness. For the ultra-slim ultra-created corresponding mechanism JLC Calibre 849 1.85 mm thick. Fabrication of such thin gauge Minimize required details of the Mechanism, but “minimizing” was conducted with the Functional Safety.